Tens of thousands of Moldovans rallied yesterday (6 September) in the heart of the capital Chisinau in the biggest street protests in memory, demanding the resignation of the president and early elections over a $1 billion bank fraud that has hit living standards. 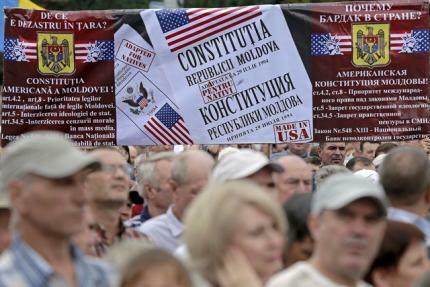 The protesters streamed into the capital from all regions of the small, largely rural, ex-Soviet state in answer to an appeal by a new mass organization called “Da!” to demonstrate in a central square outside the main government building. Police put their numbers at between 35,000 and 40,000 – bigger even than mass anti-Communist protests of April 2009 – though the organizers put their estimates at three times as many. In an egregious scam that has exposed endemic corruption and highlighted the power of oligarch groups in the country of 3.5 million, $1 billion has disappeared from the banking system – roughly one eighth of Moldova’s gross domestic output. The fraud has caused a rapid depreciation in the national currency, the leu, stoking inflation and hurting living standards. It has also tarnished the image of the pro-Europe ruling class for ordinary Moldovans, many of whom struggle to get by on a family income of about $300 a month, though many protesters carried pro-EU flags indicating that they were not against the country’s policy of European integration. Protesters, who directed much of their verbal fire at the country’s super-wealthy oligarchs who control key sectors of the economy, threatened to stage a non-stop demonstration in central Chisinau until their demands were met. “Dictatorship does not sleep. It is quaking with fear, doing everything it can to stop people from all regions coming here to the capital, Chisinau,” said one organizer, Valentin Dolganiuc, speaking from a tribune. “But we, tens of thousands of ordinary people, have come here to triumph and we shall,” he said. EU and Western officials based in Chisinau say that successive pro-Western governments have done little to halt gross economic mismanagement and stamp out widespread corruption in the political system. The banking scam has also shaken the confidence of Western allies and the international lenders who help keep Moldova’s economy afloat.ta EU budgetary support for the country has been put on hold until the affair has been cleared up. One prime minister, Chiril Gaburici, resigned earlier this year in a bizarre row over the validity of his school diplomas that was linked to the banking scam. The mass rallies will be a setback for Valeriu Strele? , whose appointment in July to succeed Gaburici opened the door to renewed dealings with international lenders including the IMF. In an interview with Reuters in August, he said that Moldova would step up efforts to try to trace the missing $1 billion and bring the money back to Moldova from bank accounts abroad. Strele? later on Sunday appeared outside the government building and said he would study the demands put by protest leaders.